I wanted to invite everyone to this great event that my good friends Jon Baiocchi and Lance Gray are putting on. The Jubilee will showcase guides, clubs, fly shops, environmental groups, and state agencies that are all working hard to make the Yuba River and her watershed the best it can be.The river is a wonderful place to fish, drift, and hike. We are looking to protect it for future generations. 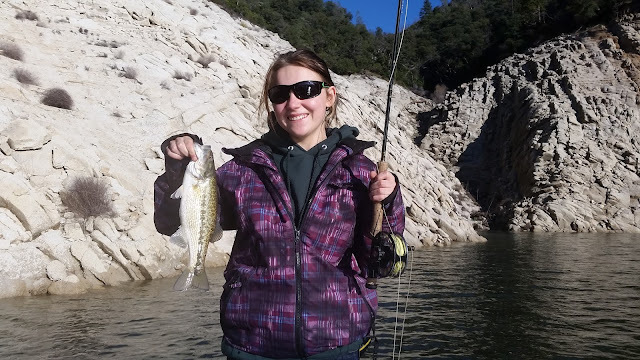 Educating anglers is the key to the Yuba River's success. If you are looking to learn more about the Yuba River in any way this is a great event and great place to do so. Chuck Ragan and I will be at this event with the "Hogan Brown Fly Fishing" Booth as well as the "Cast Hope" Booth talking all things Yuba River and Cast Hope. As long as selling some flies and merchandise. 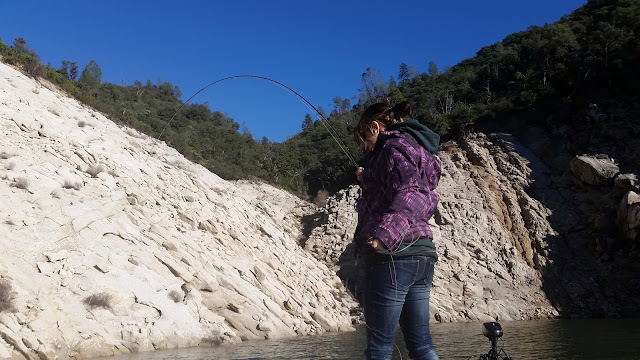 There will be many other guides, celebrities, and organizations with booths talking about the Yuba River and giving presentations from rigging to casting to fishing. There will be a raffle with all sorts of great prizes as well. This event is free to all who would like to participate! Lincoln Gray, Clay Hash, Hogan Brown, Chuck Ragan, Jon Baiocchi, Mac Noble, Lance & Kirsten Gray, Darin Elmore, Alex Ramirez, Tom Page, Jerry French, Doug Brutocao, Brian Clemens and more! Sierra Stream & Mountain Fly Shop, Fly Fishing Traditions, Cast Hope, Hogan Brown Fly Fishing, South Yuba River Citizens League, Truckee Trout Unlimited Chapter 103, Gold Country Fly Fishers, Fish First Fly Shop, Reel Anglers Fly Shop, Aqua Flies, Nor Cal Fly Guides, Orvis - Roseville, and more! Jerry French Switch Rod Casting and more! We will have a great raffle with all proceeds going to a non-profit benefactor which will be announced at the Jubilee. Driftboat Trips, Full Day Guided Trips, 1 on 1 Schools, Hats, Flies and more! 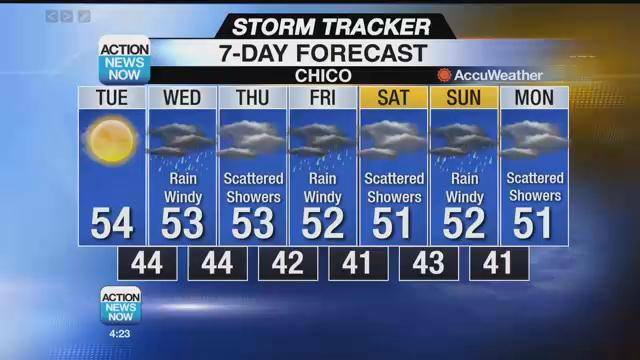 Just when the Lower Yuba was dropping and Butte Creek may be fishable by the end of the day....it is suppose to start pouring again tomorrow. Good news is the International Sportsmans Expo is in Sacramento this week from Thursday to Sunday. I will tying there in the fly fishing hall on Sunday from 10-2pm and then walking the boat all drooling after that. Come by and say hi. I will have some flies for sale, free stickers, and a few hats for people that have bad hair cuts. The Lower Yuba River was fishable for a few days at most, but with all the rain there has been massive amounts of water coming down the Lower Yuba...flows reached over 80,000cfs this last week. Check out John Baiocchis blog http://jonbaiocchiflyfishingnews.blogspot.com for some great pictures of the high water. Who knows when the river will be fishable again...My best guess is it will take a good month for flows to drop to anywhere near fishable and then any storm will blow the river out again so who knows consistent flows may not come until May/June. No matter when it is going to be a completely different river when the flows do drop. Feather River...I have not heard any reports sense the upper stretch above Hwy 70 opened Jan 1 but I did drive over the river this afternoon (Jan 7) and the river was starting to color up meaning that lake oroville was getting muddy. Fellow Guides Ryan Williams and Chuck Ragan have been doing some winter spotted bass fishing on Lake Oroville and having some pretty epic days. 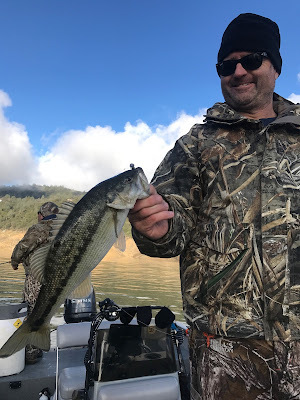 Ryan is really one of the pioneers of this winter spotted bass fishing as he has developed a system fishing indicators and suspended bait fish patterns. Very similar to the Float'n Fly method many conventional bass anglers use. 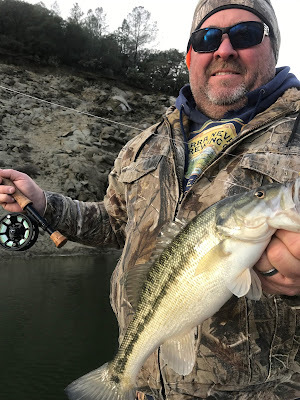 It is not summer or spring bass fishing where fish crush stripped flies, but it may be the only game around for a while....Spotted bass fight much like smallmouth bass and make up for what they may lack in size with their fight. Average fish is about 1-3lbs. Lots of stuff happening over the next few months...Here are some events that I will be at if you wanna stop by and say hello. Jan 22 - I will tying flies at the ISE Show in Sacramento in the Fly Fishing Building. Come by I'll tie you a fly. Feb 18 - Yuba River Jubilee at Hamond Grove Park in Browns Valley - I will be there with the "Hogan Brown Fly Fishing" Booth as well as the "Cast Hope" booth. Chuck Ragan will be there helping me with both. I will tying, selling some flies, talking guiding, cast hope, and all things yuba and fly fishing. Feb 25 - I will at the Cast Hope booth at the Pleasanton Fly Fishing Show and Cast Hope will be hosting our 3rd annual "After Party at Gastros Pub" that evening! Come to the show, stop by the booth, and then head over to the after party for beer, food, auction, raffle, and more! While storms are hitting the North State Spring and Summer Striper season will be here before you know it. Last season I was booked up through Sept by April so this year I have added two additional Licensed Coast Guard Captains to take my over flow and accommodate 2-3 boat trips. I had to turn away a lot of people last season so hopefully this will help get more people out. I will be releasing my March-Sept Trout, bass, shad, and striper dates here in the next month so keep an eye on your email or the blog for dates if you would like to get on my calendar for striper season.